During our regular testing of new cars it’s surprisingly rare for a car to attract more than passing attention from the general public. Outside of supercars such as Ferrari and the like it generally only happens when so-called ‘retro’ cars emerge such as the New Beetle, Nuova Fiat 500 and Chrysler PT Cruiser. We’ve just spent a couple of weeks travelling around in the newly-released Citroen C4 Cactus and it has certainly turned plenty of heads. Aside from the predictable chuckle about the car’s name the biggest attraction were the large plastic panels that protrude from its side doors. Called AirBumps the panels have soft air-filled pockets that act as shock absorbers to protect the sides of the car from day-to-day bumps and scrapes. At the Cactus launch earlier this year we were allowed to ram a supermarket trolley into the doors without managing to damage them in any way. Take away the AirBumps and the Cactus isn’t that much different in appearance to many of the new breed of hatch/SUVs crossovers. That is until the huge array of personalisation options come into play. There’s a choice of ten body colours as well as different, generally contrasting, colours for the AirBumps, door mirrors, wheels, roof bar and even the Cactus lettering on the rear side panel. Note that only the black AirBumps, door mirrors and roof bars are standard, other colours, including nine of the ten body colours, are extra cost options. The customisation continues inside Cactus with six different trim options for the seat trim and dashboard. Once again only one colour is standard, the other five will cost either $800 or $1600. There’s good interior space with plenty of headroom throughout and acceptable legroom in the rear. There’s a nice airy feel that’s enhanced with the optional panoramic sunroof. Another unusual feature is the front-hinged pop-out rear windows. While there is likely to be some resistance from rear-seat passengers, most cars now run with their air conditioning on so it’s less likely to be a problem than it would have been in the past. Two advantages are that they reduce the car’s weight by around 11 kilograms and that, the absence any wind-up mechanism inside the doors allows for larger door storage pockets. Likewise storage space at the front of the Cactus is improved through an 8.5-litre top-opening glove compartment which can operate in that way because the front passenger’s airbag is fitted within the roof rather than inside the dashboard. The two front occupants sit in comfortable and supportive bucket seats that are linked by a central section finished in matching material that gives the appearance, when the retractable armrest is raised, of an old-fashioned bench seat. The parking brake, a large and heavy aircraft-style push up/down unit, sits in front of the centre of the seat. The boot has a reasonable capacity of 358 litres, 1170 litres with the rear seatbacks folded. There is a 15-inch steel spacesaver below the boot floor – fitted wheels are 17-inch alloys. There are only two powertrain options, petrol-manual and diesel-automatic. The petrol is a 1.2-litre three-cylinder turbocharged unit that puts out 81 kW of power and 205 Nm from 1500 rpm. The turbo-diesel peaks at 68 kW and 230 Nm at 1750 rpm. The manual gearbox only gets five cogs, the semi-automatic adds one more. The latter does present problems – more about that in our drive impressions. The gear selector for the automatic transmission uses three large buttons mounted on the dashboard. The options are Drive, Reverse and Neutral, there is nor Park option. Standard safety equipment includes six airbags; enhanced ABS brakes (with brake assist and electronic brakeforce distribution); electronic stability and traction control; tyre pressure monitoring; reversing camera; rear parking sensors; hill start assist and Isofix child seat mounting points on the outer rear seats. Standard on both variants are roof rails; LED daytime running lights; front foglights with a cornering function; reversing camera; rear parking sensors; satellite navigation; DAB+ digital radio; Bluetooth phone and audio streaming; and a USB socket. We were able to spend a week in each of the two Cactus (Cactii?) variants. We reported on the petrol-manual version recently so we’ll concentrate on the semi-automatic diesel here. Also known variously as an automated manual or a robotised manual gearbox it’s certainly an acquired taste and one that will prove frustrating to anyone expecting the smooth changes that the typical auto provides. It’s jumpy and feels unpredictable at times. The delay from first to second gear is very noticeable when trying to pull quickly into traffic. You do learn to adapt to this transmission type, but a conventional automatic transmission really would be much better. On the positive side the transmission contributes to a remarkably low listed fuel consumption figure of just 3.6 litres per 100 kilometres. As is the norm we couldn’t match that number, averaging just under 5.0 L/100 km during our test. Once clear of the suburbs the problems with the transmission are only noticeable on long hilly terrain, otherwise Cactus is capable little car without any real sporty pretensions, but that’s not unusual in this class. Suspension is on the soft side, steering is light with a little more body roll than we’d like. The latter is typically Citroen but overall the ride and comfort is very impressive for such a small car. Some people prefer their cars to merge into the background, others just love to be noticed. 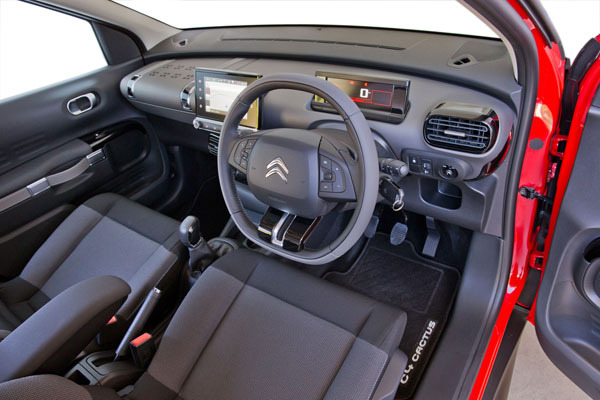 Citroen owners traditionally make up a good proportion of this latter category and the C4 Cactus ticks plenty of boxes for them with the look-at-me customisable exterior enhancements and quirky interior. 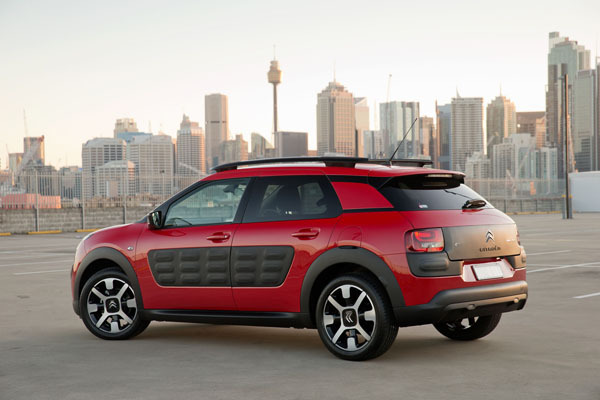 Prices of the new Citroen C4 Cactus ($26,990 for the petrol-manual and $29,990 for the diesel-auto), are towards the top end of its class although, like all cars in the Citroen range, it does come with an impressive warranty – six years and unlimited kilometres. Note: These prices do not include government or dealer delivery charges. 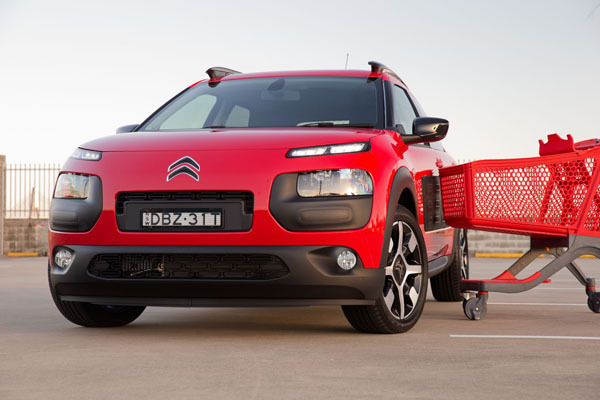 Contact your local Citroen dealer for drive-away prices.